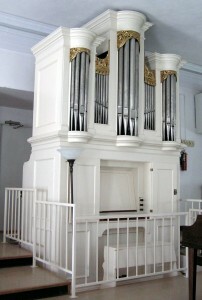 The Old Organ at Zion Lutheran Church in Spring City, PA.
October 9, 1791, the day the Tannenberg organ was dedicated and used for the first time at Zion Lutheran Church, was, according to church records, “next to the day the church was constructed, the most eventful day in the history of the congregation”. Zion was the first church in Chester County to obtain an organ, and soon became known as The Organ Church. From the beginning the organ was a treasure, for its builder, David Tannenberg, was the foremost American organ builder of the eighteenth century. David Tannenberg was born in Saxony in 1728 and emigrated with his family to America in 1749. They settled in the Moravian community of Bethlehem, Pennsylvania, where David Tannenberg initially worked as a joiner. There he learned the art of organ building from Johann Klemm, who, having been trained in organ building in Dresden, Germany (possibly with the great Silbermann), had arrived in Bethlehem in 1757. Tannenberg and Klemm collaborated on several instruments for Moravian chapels near Bethlehem and Nazareth until Klemm’s death in 1762. 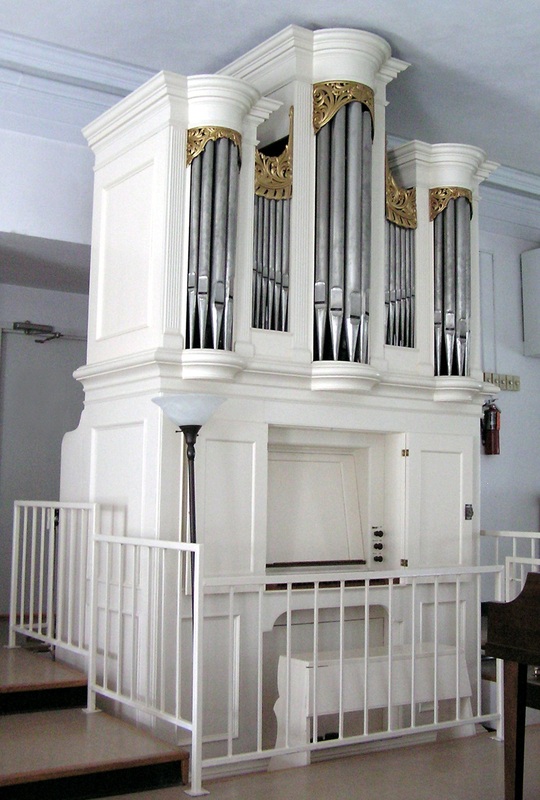 Tannenberg’s development as an organ builder was also influenced by a treatise on organ pipe scaling written by Johann Sorge, a German musician and theoretician, sent to the Pennsylvania Moravians in 1764. Sorge’s work, entitled The Secret Art of the Measurement of Organ Pipes, enabled Tannenberg to mathematically determine the dimensions of every pipe in a rank. Tannenberg moved in 1765 to the Moravian community of Lititz in Lancaster County, where he built organs for forty years, not only for Moravian, but also for Reformed and German Lutheran parishes, some as far away as North Carolina. Tannenberg built the Zion organ at the peak of his career. The previous year in 1791 he had completed a four year project, building what was said to be the largest and finest organ in eighteenth century America, a three manual, thirty-four stop organ for Zion Lutheran Church in Philadelphia. Sadly, the organ was destroyed by a fire four years later. The Tannenberg in Zion Lutheran in Chester County is one of only nine Tannenberg organs remaining of the nearly fifty that he built. It is unique in having a “composition” pedal that enables the 4′ and 2′ stops to be added or removed together. Costing £150, the organ was installed in Zion’s 1775 stone church during the pastorate of the Rev. John Voigt. When that structure was torn down in 1861, only the altar, a few benches, and the Tannenberg organ were saved and moved to the new building. Since the organ had to be dismantled anyway, “improvements” were made to “modernize” the organ. Tannenberg’s keyboard, which used ebony on the natural keys and bone on the sharps and flats, was replaced with a new keyboard. At that time the keys were also lengthened to conform to newer standards. The work was done and the organ was installed in the church by Bohler of Reading, Pennsylvania, as was noted in pencil under the keyboard. In 1881 the organ was moved from the gallery to the northwest corner of the main floor. At that time the 3′ Quint (equivalent to a modern 2 2/3) was changed by the deletion and addition of eighteen pipes, into a Principal. It is noted in pencil under the keyboard that J. W. Custer of Pottstown did that work. The organ was revoiced and tuned by Gustavus Schenkle of Philadelphia, and all the work was paid for by the Ladies Aid Society. In 1912, a new, larger organ with an electric blower was purchased and placed on the opposite side of the chancel. The Old Organ was revered, however, so it was kept and the church Council voted that the Tannenberg be played annually on the Sunday nearest October 9th to commemorate its dedication in 1791. Thus began Old Organ Sunday. The organ received a blower in 1953, replacing the rope pump, and the case was painted white, as it had been in 1791. When the church merged with Spring City Evangelical Lutheran Church in 1972, a decision was made to enlarge and use the Zion church. The organ was stored for two years and then reassembled in its present position in the balcony. In 1998, after years of seeking funding, the Old Organ was totally restored by Patrick Murphy & Assocs., Inc., with Ray Brunner, the world’s leading authority on early American German organs, consulting. The 3′ Quint was restored, a new keyboard was built, which is a duplicate of Tannenberg’s, and the winding was restored so it could be hand pumped. Thus, Zion Lutheran Church is pleased to share with you the marvelous sound first heard by David Tannenberg and the people of Zion over two hundred years ago.